I was looking for the right piece of artwork for the half bathroom, needless to say I've been looking for months (and months, like last year) now, and just not finding what I wanted. A few months ago I decided I wanted my accent color to be emerald green and I liked the tropical leaf prints. What I was seeing was hand painted leaves which are beautiful, but just to exactly what I was looking for or looking to spend. 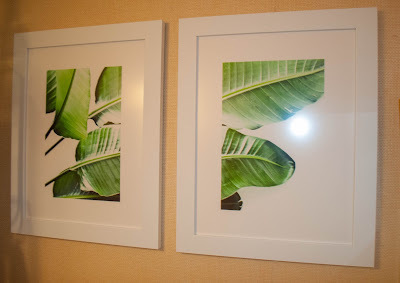 Then I reading some new posts on Sarah M Dorsey Designs blog and remembered her Large Scale Banana Leaf Prints, I guess I didn't notice before that she was selling the images for $5.00, I got really excited and ordered them from her - see the directions on the bottom of her page. I had to add a little side note - Sarah is so nice! I have ordered from her in the past (remember the Living Room Stencil Wall?) She emailed me back so quickly, both times, and from what I can see, she replies to all of her comments on her blog. I felt like I was talking to a celebrity, cause she's pretty famous in the bloggersphere. Sarah had order her prints from SnapBox. I've never heard of them, but decided to follow the link to check them out. Umm, So. Glad. I. Did. So first, they offer a 30% to first time buyers. I ordered my prints in 10 by 15 to keep in scale with Sarah's pictures. With my coupon the total for the two prints was $21.00 bucks, um yes, for two framed pieces of artwork. AND they can so well packaged with the hanging wire already perfectly attached to the back. I was really impressed. I have to add 2 things, first the picture was 10 by 15, but then they put a 3 inch white boarder and a 2 inch word frame, so you are really getting your money worth, and some. And 2, I ordered on a Tuesday, delivered by Friday. So hello to photo galleries, now more of my pictures will make it to the wall! I just love the way they turned out, I'm not kidding it makes the bathroom look notably larger than before.